If you want to transform your health and body image, you need to stop measuring your losses and instead measure your gains. “Lose weight, lose inches, lose fat, lose pant sizes, lose your belly…lose lose lose!” I hate losing. I don’t know a single person that likes losing. This is a horrible way to approach anything. It is time to change our vocabulary, mindset, and measurements so moving our bodies isn’t something we HAVE to do but WANT to do. It’s time to stop losing and start winning. The first thing you need to do is to stop looking at letters and numbers. No more measuring how many inches you lose, pounds you shed, and sizes you dropped! These numbers are arbitrary and have absolutely no bearing on your worth as a human being. More importantly, your weight can fluctuate from 5-10 pounds in one day. If you don’t believe me, try weighing yourself every hour like this woman whose weight fluctuated by 7 pounds in a day. You need to understand that your water intake, bathroom habits, exercise, and what you have eaten in a day affect which direction the numbers go on the scale. If you have a lot of sodium or carbs in one meal, your body will hold onto more water and the numbers go up. If you drink a lot of water (which you should), the number on the scale will also go up temporarily. 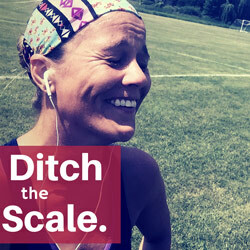 Ask yourself, “Does the scale bring me joy?” If you answer “Yes” to this, than by all means keep it. However, ditching it will give you more space in the bathroom and less to obsess over. You can’t “be” a “L” and it doesn’t mean you “are” Large. “L”, “S”, “M”, and “XL”are letters used to categorized clothing, nothing more. The number on your pant size doesn’t mean anything either. In high school, I remember thinking I was fat because I had to wear size 10-12 pants to fit over my strong soccer thighs. I was on every diet in the book and starved myself at times to try and get to a size 4 or 6. Meanwhile, in the gym I was lifting more than half the boy’s on my soccer team. The numbers do not have meaning unless you give them meaning. They don’t make you more beautiful or better. Also, sizes vary from brand to brand. I wear clothes of all different sizes! Check out this lovely girl who tries on various skirts to show you that beauty is not in the numbers. Your mood can be quite the motivator when it comes to movement. I mean, who doesn’t want to be happier? Before you exercise, (or move rather), take note of how you feel. You may feel sad, irritable, or angry. Then check in and see how you feel after you move. I have yet to meet someone that actually feels worse. Movement is the best kind of medicine. It’s your body’s natural anti-depressant. It releases all those good chemicals that get you going and boost the level on your happy meter. Measuring your energy level is a great way to keep you going on the movement train. Yes, it can be difficult to get started since many of us feel sluggish and tired. However, once you start going you will find yourself getting a natural boost of energy that lasts way longer than the caffeine or sugar fix. Keeping track of how you feel before and after you exercise can help you stay motivated and productive throughout the day. Instead of going for an afternoon caffeine fix, try a 10 minute brisk walk or afternoon cardio class to wake you up. I would much rather count sheep than calories. When we move, you don’t even have to count sheep because it is much easier to fall asleep. Who doesn’t want a good night’s rest? Tracking your sleep pattern when implementing a movement plan is a great way to measure your health. Studies show that exercising regularly will improve your sleep, which then leads to feeling restful and amazing. It’s time to measure the good stuff and be grateful. Ditch the negative self-talk and replace with more loving statements. No more “I have to go to the gym”, “I am fat”, “I don’t have time” or “I can’t”. Stop bullying yourself and start loving. Look in the mirror and say “I love you”. Love your body for all it does for you. If you need help with this, try my “I Love My Parts” printable. Honor your body and make time. 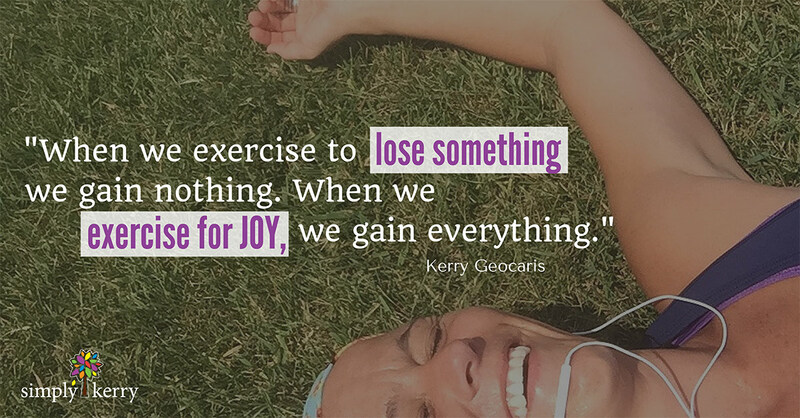 Celebrate when you walk, run, go to the gym, or play with your kids. Be grateful for all the good in your life so that good can grow and grow. Move because you can. Move for the joy of doing so. Be grateful that you can. If you need some movement motivation and want help tracking your transformation, download my free Transformation Tracker now!